Every once in awhile a project comes along that shakes up our ideas of what a traditional wedding looks like. Sons of Roses is a bold and inspiring project that brings to light themes of love, union, marriage, and inclusivity. 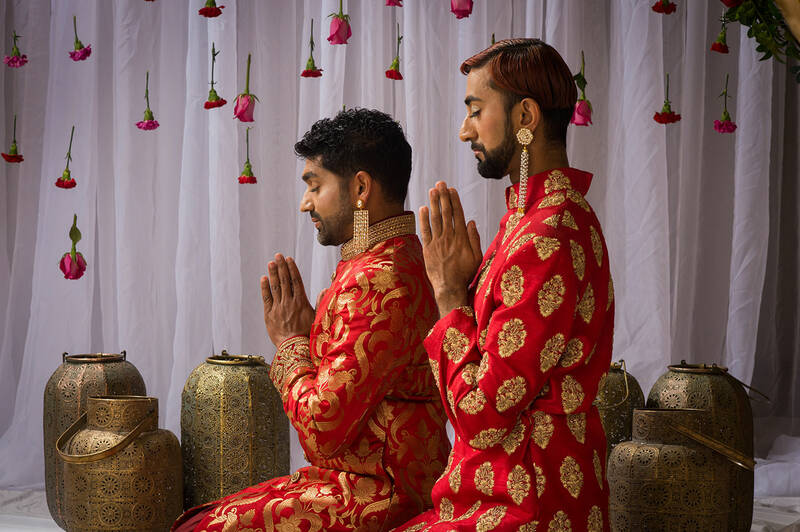 Haran Vijayanathan and Humza Mian (who are not together in real life), agreed to participate in the photoshoot as two grooms in a traditional, yet non-denominational, South Asian wedding. The stunning shoot was directed and styled by Saira Hussain (Breath of Henna) & The Sai Lens and was a joint collaboration with Must be Kismet Bridal Show & Magazine and other artistic vendors. 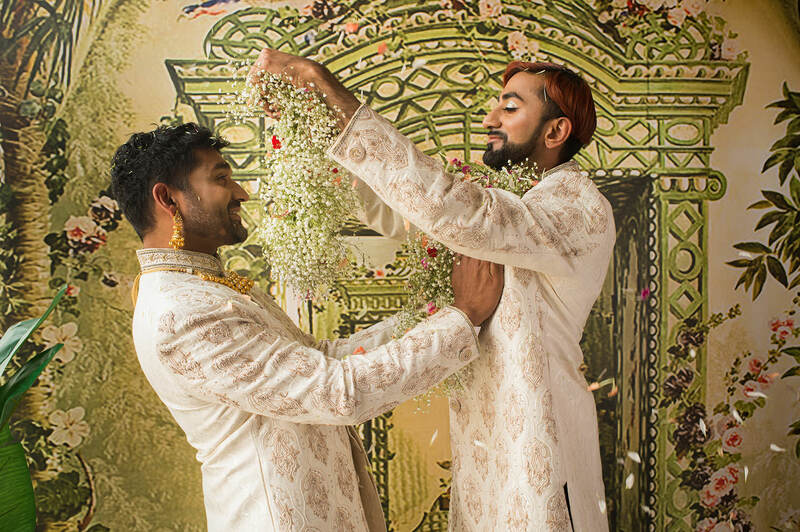 Abhirami Balachandran and Angel Glady, two members of the South Asian LGBTQ community, also participated in the project, portraying friends of the grooms on their wedding day. Check out the entire shoot at www.mustbekismet.com. 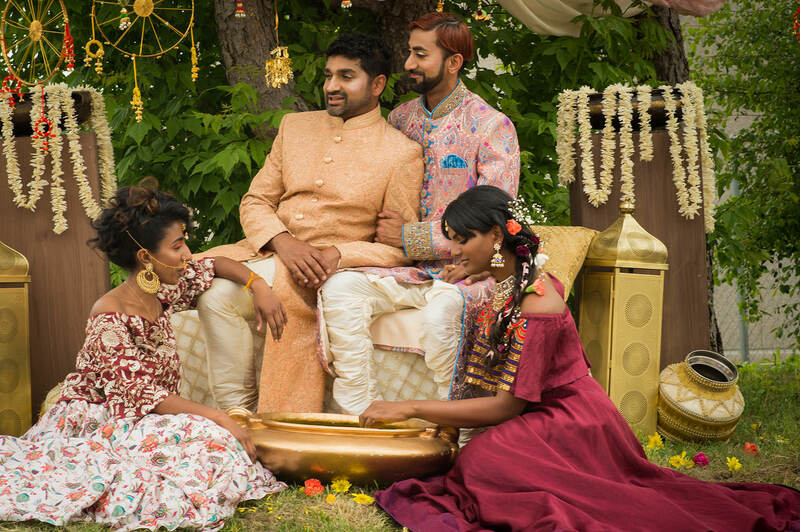 Models Haran Vijayanathan (sitting in the front) and Humza Mian are members of the South Asian LGBTQ community in Toronto. They participated in a photo shoot by Must Be Kismet, a desi bridal show, and magazine. Also seen in the photo are Abhirami Balachandram and Angel Glady. Photo by Banga Studios. This Saturday, June, 23 Haran will be the first Sri Lankan, Tamil speaking man to be a grand marshal at Toronto’s Annual Pride Parade. He will be marching alongside his mother and sister. His hope is that others in the community who are struggling with reconciling their religious or cultural identities with coming out will feel more supported and a little less alone by seeing someone similar to them represented. On the topic of marriage, Haran says that his preferred wedding would be a simple affair without a lot of pomp and pageantry. Humza, who identifies as queer, is a veterinary technician by day and a popular drag queen by night. His followers on social media know him as Manghoe Lassie, and his vibrant personality and love of his craft radiate through his pictures and videos. He is partially out to his family – his sisters and cousins know and support him; his parents and aunts and uncles do not yet know. He believes that coming out is an ongoing process and not the same for everyone. Above all, individuals should feel safe and emotionally prepared in their choice to come out. Humza envisions a wedding in his future, that may not be traditional or in line with his Islamic faith, but one that includes his friends and family. Both Haran and Humza consider themselves religious and take great solace in the tenets and practices of their faith. Haran, like many Hindus, has a mandir in his home and does pooja twice a day in honour of the deities. He appreciates the many gods and goddesses in Hinduism and the way in which this ancient religion considers people and spirit and life as fluid and ever-changing. Humza, a practicing Muslim of Pakistani descent, enjoys attending Khutbah, a formal occasion where an Imam preaches and conveys the teachings of Islam. He says that the principles of his faith that are most important to him centre around being a good person and service to others.